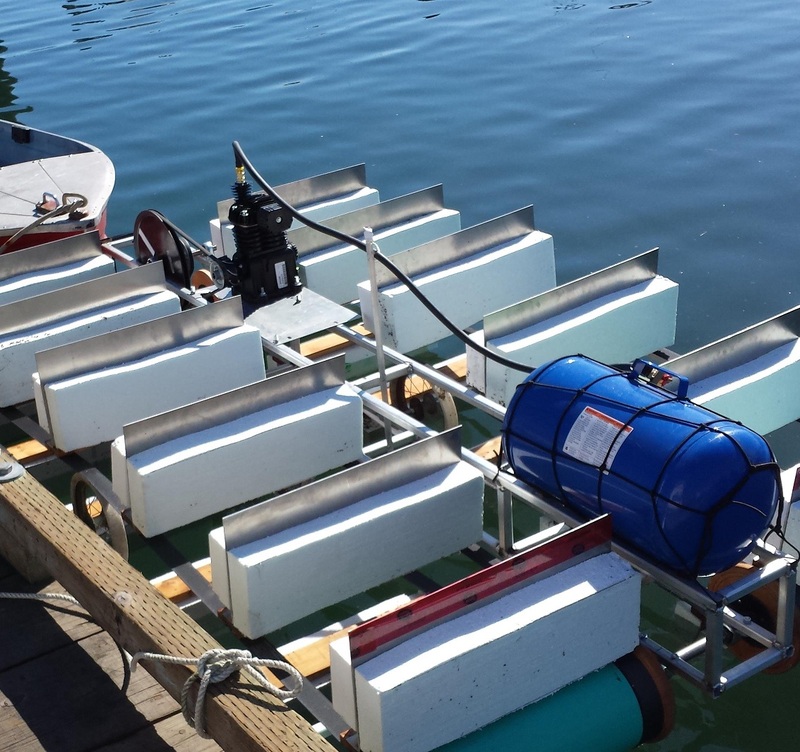 Go With the Flow Technologies—-GWFT, is pleased to welcome and enlist the expertise of William (Bill) Jones, President of Seeley’s Cove Research Center Inc, in the further development of the AquaCannon aeration system by using the energy of tidal currents to replace both diesel and electric motive power. The above photo is one of the original prototypes that is capable of producing close to one Kw. Joe Sieber, President of GWFT, has authored several wave energy patents (a technology now sold) and now has patents pending in the US, UK and Canada, respecting tidal currents, ocean and river streams and wind streams. GWFT was incorporated on June 29th 2015, but actual development of the tidal current focused technology began at the beginning of the year. We have designed and fabricated an ocean ready prototype that allowed us to test and demonstrate the technology. the capital cost to build, deploy, maintenance and operation amortized over 20 to 25 years and will be reduced with further refinements. Our first test was equivalent to the introduction of the first Ford Automobile as proof that it can replace the horse and buggy. Our refinements to date have taken us to the equivalent stage of the first Ford Mustang. We believe that with sufficient and timely funding, the TCSC can be ready for commercial market readiness for some products by the end of 2016. Magnitude of scale compressed air motors and generators to name but a few. The Tidal Current Surface Crawler is a floating surface device with no requirement for specialized vessels or ocean foundations, making heavy lift equipment unnecessary. Deployment is achieved by simple assembly of the modular components. The TCSC operates in synergy with Nature, and is a game changer in tidal current energy extraction. • Requires less fabricated material/kW, is much more efficient in energy capture, is totally environmentally benign, and is relatively inexpensive. • High sensitivity to current flow with only minor friction losses, and as such can engage the small velocities of ocean currents such as the Gulf Stream. • Directly suitable to river currents without negatively affecting fish habitat. • Can capture up to 45 per cent of the kinetic energy of a moving volume of water. • Energy capture is totally linear and capable of supplying hundreds of MW into the grid. • Has no impact on marine life and deployment areas become sheltered fish habitat. • Power take-off is direct mechanical, with the drive train being above the water line. • Anchoring is slack moored, fore and aft, allowing tidal flow energy capture bi-directionally. GWFT captures and converts the Kinetic Energy of a moving volume of fluid, over a linear distance, rather than from a narrow swept area of lateral interference. This is an endless belt of engagement with the moving water allowing efficient direct and linear mechanical energy extraction. Small Units to Power your hunting camp or cottage along or near a river or creek. Full size units to Supply mega watts to any industry/town built along or near a river. Many possibility’s, all non polluting and non destructive to the environment. Uncomplicated design, easy to maintain and very quiet, low volume splashing sounds only.